There’s a a spectacularly eerie song, called “Danse Macabre” composed by Camille Saint-Saëns, that is woven through the narrative of Samantha Shannon’s The Bone Season. You should definitely listen to it if you’re thinking about reading this book. It’s fevered, emotional, dark, at times frenzied, rich and innovative; a tone poem set for orchestra that is aptly paired with this captivating tale. There’s been so much buzz about this debut, which will eventually be a seven book series, and has already been optioned by Andy Serkis for the big screen, that I was all atwitter going in to it. And! I was enthralled. It’s 2059 and Paige Mahoney works in the criminal underworld of Scion London, part of a Dickensian secret gang known as the Seven Seals led by a mad genius (reminiscent of Benedict Cumberbatch’s Sherlock). Paige is a dreamwalker, a rare kind of clairvoyant, and in this world, the voyants commit treason simply by breathing. But when Paige is captured and arrested, she encounters a power more sinister even than Scion. The voyant prison is a separate city—Oxford, erased from the map two centuries ago and now controlled by a powerful, otherworldly race, the Rephaim. Paige is assigned to a Rephaite keeper, Warden, who is in charge of training her to be one of their mercenary soldiers. 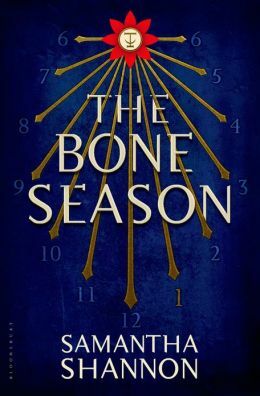 The Bone Season felt like a wonderful, gritty concoction of The Hunger Games, The Name of the Star, Daughter of Smoke and Bone and The Matrix, yet all while imbibing something original in to the world of Dystopian/Sci-Fi/Fantasy. There is a lot of terminology and texture to this world, which takes some adjustment. The immersive quality of Shannon’s writing and world-building pulls you under like a riptide, and the pacing is just as quick, but it works. The book opened my mind, leading me to think and question, engaging me in a whole new way. I felt invested in the characters and their future, salivating over each word and revelation, lingering on even after I finished the last page. I’m inspired by Shannon’s talent and impatiently await the next installment in this addictive series!